Attorney General (AG) Githu Muigai has faulted the National Super Alliance (NASA) for planning to swear-in Opposition leader Raila Odinga next year. On Monday, AG Muigai tore at some Opposition lawyers for misleading Kenyans on what he says are treasonable offenses. According to Prof Muigai, the NASA-affiliated legal minds have been trying to justify plans to swear-in Raila as the ‘People’s President’. 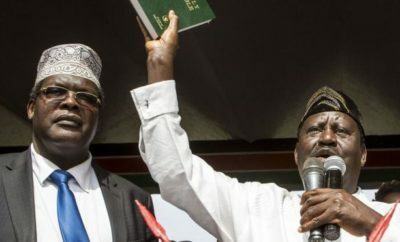 Raila himself said on Sunday in Kilifi he has to be sworn in in that capacity. “Section 40 declares what is high treason which is the overthrowing of the legitimate Government of the day. That is high treason. Article 42 explains in detail what high treason is,” said the AG. Muigai also took a swipe at a Senator in the Opposition outfit for misleading Kenyans and NASA chiefs on the Raila inauguration. “Some politicians can never seem to keep their mouth shut on issues they have no idea about. Some Senator says there is nothing in Kenya like treason law, but colonial law. [Siaya Senator James Orengo is on record as making such comments]. “This is a man sitting in the Senate…a lawyer who says I have practised law for 40 years and there is no law to protect the Constitution from illegitimate overthrow. 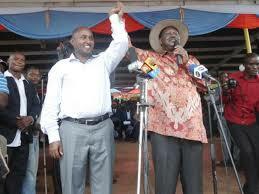 I think he belongs to a different forum!” Muigai said. Muigai was speaking during the launch of an action plan for 2017 to 2022 to ensure speedy and legal aid to all. NASA announced it would resume plans to inaugurate its chief and the People’s Assembly process. The coalition said on Thursday the inaugural session of the National People’s Assembly would take place early next year. “Following the postponement of the launch of the People’s Assembly that was to take place on Jamhuri Day, Tuesday December 12, the Organizing Committee wishes to announce the resumption of the People’s Assembly process,” the committee said in a statement on the NASA official website. The planned meetings will involve leaders of different regions to deliberate on national governance, read the post. The Opposition postponed the inauguration and the launch of the People’s Assembly on Sunday , December 10, 2017. The events were to take place on Jamhuri Day. “We are aware that this will be a disappointment to the people of Kenya who were eagerly waiting of this occasion. We wish to assure them that our resolve has not changed,” NASA said in a statement. “We wish to thank the Government and people of Mombasa County who had graciously offered to host the event. Thank you very much Mombasa…we shall be announcing the new dates of both the swearing in ceremony and the launch of the People’s Assembly as well as a more vigorous and prolonged resistance in the coming days,” the statement read in part. 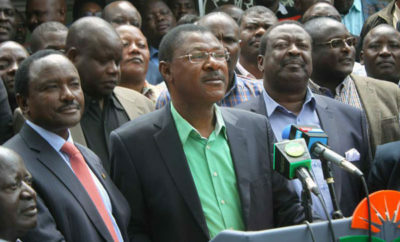 NASA’s announcement came in the backdrop of tough talk by President Uhuru Kenyatta against dissent Thursday last week. President Uhuru talked of taking of ‘firm’ action against governors calling for secession. 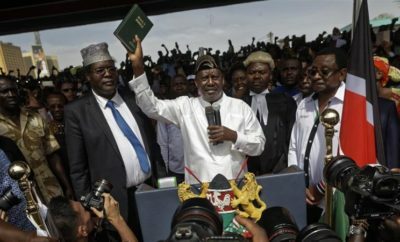 Secession has been a popular topic within the Opposition ranks with Raila aide Dr David Ndii being seen as its chief proponent courtesy of his eloquent articulation of the idea in print and television. Homa Bay Town MP Peter Kaluma has drafted a Bill seeking the secession of all but seven of Kenya’s 47 counties to form the People’s Republic of Kenya. President Uhuru spoke when he opened a four-day induction workshop for all the 47 governors and their deputies at Diani Reef Hotel in Kwale County.